Are Broken Windows Costing You Money? It’s amazing how environment can affect our experience and shape our beliefs. As dentists, sometimes we get so caught up in the doing of the dentistry that we forget that there are other factors dictating and affecting the experiences of our clients and patients. Sometimes I speak to Dentists who only ever enter and leave their offices and buildings via the back door. In so doing, they never see and experience the turn-ons and turn-offs that are shaping and affecting the experiences of their customers who enter and leave only via the front entrance. In his book Broken Windows Broken Business, Michael Levine discusses his premise that all big dilemnas in business arise from a lack of attention to small detail. And we can see this in our own business if we only took the time to walk in and out of our own front door and look at our business through the eyes of the patient. We need to see our Dental Office as our patients see us. Not as we see it. Not as we see it from the inside looking out. But as our patients see our business from the outside looking in. What do our patients see when they arrive at our building? Do they see leaf litter outside of our entrance? Do they see trash and dirt on the outside of our building that we never see, because we enter and exit through a private back entrance? Are they spotlessly clean or are they smeared with rain and with dirt? Are our glass doorways clean and impeccable? Or are they too smeared with nature’s rain, or children’s handprints? If we do not enter our office from the front on a regular basis we could be doing ourselves out of significant business, simply because we fail to see these “broken windows” that our clients and customers see on their visits. It’s funny. Not funny ha ha. Rather funny strange. There’s a Dental Office right across the road from the exit of my local supermarket. And this Dental Office always looks like it needs a good spruce up. The lawn always looks like it needs mowing. The edges always look like they need doing. The building just looks so untidy. And in so doing, it looks uninviting. There’s a point where enough becomes enough. There’s a point where our patients come to believe that if we do not look after and maintain the entrance to our own building, whether it is our building or whether it is owned by a third party, our patients start to believe that we as their dentists are going to start neglecting the entrance to their body, [i.e. their mouth], in just the same way that out office entrance is being neglected. So we need to be on top of our presentation of our facility. One of the major difficulties I had towards the end of my time in my own practice was in dealing with landlords who would not invest in fixing and repairing the “broken windows” in their buildings. Untidy entrances with worn out walls and paintwork. Lifts and elevators needing a makeover. It becomes very difficult to project an image of quality and care when valued clients and customers have to negotiate their way through a maze of building disrepair and neglect that is thrust upon them by an uncaring landlord. Or is thrust upon them by an uncaring owner of the Dental Office, who enters and leaves only via the back door, and never takes time to view his Dental Office from his patients’ points of view. So how is the patients’ view when they arrive at you Dental Office? Are you unwittingly doing yourself out of business? Are you missing your own “broken windows”? My Two-Day Workshop in Las Vegas on September 25 and 26 was a huge success. At that workshop I explained the COMPLETE Ultimate Patient Experience process in detail, covering in greater depth how to address simple changes that create BIG RESULTS. I read a great blog post from Seth Godin last week. Titled Ad blocking the blog discussed how in business, the way to be successful is to stick to the age old fundamentals of growth. The first four of these fundamentals were indeed “Home Truths” when it comes to building a business, any business, and are just as applicable to both Dentistry and Dentistry today as they are to all businesses. Because running a Dental Office is still business. Do it badly, and you’ll be out of business, closing down, and your patients will need to find another Dental Practice to attend. So here are those four key fundamentals, along with my Dental Practice take on how they apply to the business of Dentistry. The best marketing isn’t advertising, it’s a well-designed and remarkable product. You can’t advertise your way to success if you have a poor product. Your product has to support your advertising claims. If the product’s no good, then the advertising is not going to resurrect the product. In Dentistry, you need to walk the walk as well as talk the talk. You need to be providing good dentistry with good service to keep people coming back. If your service is lousy, if you’re not schmoozing and WOWing your clients and customers, then patients will simply leave your Dental office and take their business elsewhere. Why do they need to put up with *YOUR* bad service? I’m always alarmed when Dentists make contact with me and tell me that they need more new patients. Why do they need more new patients? Aren’t they keeping their existing patients? If these Dentists have been in business a while, then they should have built up a core group of loyal patrons and patients who are happy to come to the Dentist and happy to accept recommended treatments and happy to refer their loved ones and friends. So why do they need more new patients? Something is obviously not computing…. The best way to contact your users is by earning the privilege to contact them, over time. Bombarding your customers the moment you acquire them is a sure way of turning them off of you. You need to build trust, and sometimes the building of trust takes time. Occasionally we can sell treatment straight off the bat to new patients, but often, there’s a “getting to know you” period that needs to be negotiated through. It’s amazing how much mutual trust is built with long-term patients over time. These patients are the true core of your Dental Practice. Growing the size of this core of true believers should be every Dentist’s aim. But it does take time…. Making products for your customers is far more efficient than finding customers for your products. This point relates totally to your Customer Service Systems. A well thought out complete system of providing Exceptional World Class Customer Service for your patients will keep them as loyal fans. 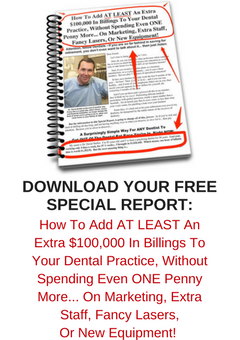 It is far more efficient and far more cost effective to be keeping and holding onto existing patients than to constantly be chasing new patients for your practice. Existing patients already love you and trust you. Chasing after new patients often results in us neglecting our existing patients. And it is these neglected patients that leave and take their business elsewhere, because of our apathy towards them. Horizontally spread ideas (person to person) are far more effective than top-down vertical advertising. When people are talking about your practice, your Dental Office, your business, in a positive way, then that’s a far more effective means of advertising than simply throwing money at regular top-down marketing. We’ve all made recommendations to our friends, such as good movies to see, and great places to eat. And it’s the same for great service, even at the Dentist. Word of mouth is very powerful. In summary, keeping patients by WOWing them and providing them with World Class Customer Service makes far more business sense. Ignoring existing patients, so that they leave you, and then spending up big on advertising and chasing after new patients just doesn’t seem logical. My Two-Day Workshop in Las Vegas September 25 and 26 will explain to you the COMPLETE Ultimate Patient Experience process in detail. cover in greater depth how to address simple changes that create BIG RESULTS. For all the details about Las Vegas, CLICK HERE. Are you WOWing Your Customers When Things Don’t Go To Plan? One of the side effects or pitfalls of being in business is that sometimes things do not go as planned. That’s just part of business. One of the primary things to do, when in business, is to identify where and when things in your business can go wrong, and to try to minimise the occurrences of those service defects. Following on from that, the next most important thing to do is to have a contingency plan for when things do indeed go wrong. Knowing each thing that can go awry in your business and knowing what to do to rectify those defects, and then carrying through on your service recovery is what sets great businesses apart from the good and the not so good. Your service recovery processes in your business need to be so well crafted and created that the experience your customer has during the service recovery is even better for your customer sometimes than if things had actually gone right in the first place. Fixing your service defects, therefore, cannot be a haphazard process. There is no point at all in making things up as you go along, when it comes to recovery from service defects. Your business must have a logical sequential process of service recovery that includes checks and balances and feedback loops to ensure that your processes are indeed hitting home and undoing the original errors and fixing the problems. A business where employees are on top of the defects when they occur and are empowered to rectify those defects is far more impressive to deal with than businesses that have delayed responses and businesses where employees require permission from higher authorities before acting to make right the original wrongs. In Dentistry you never want your Front Office people telling callers and patients that they “need to check with the Dentist” about something, before it can be rectified. Rather, your team members need to be empowered to act independently, in a responsible manner, to take charge and to make good quickly any disappointment experienced by your valued customers and patients. When things don’t run to plan, and results aren’t consistent, then we need to have protocols in place to limit our customers’ disappointments, and quickly turn those disappointments into fresh positives. What happens in your Dental Office when a valued patient arrives for their appointment, with an appointment card [with your team member’s handwriting on it], for an appointment that is nowhere to be seen in your appointment book? That never ever happens…. or does it? Do you have a service recovery plan? What if there’s absolutely no way you can see your patient, because there are other patients in need in the appointment book already? Do we try to see the affected patient anyway, and give them a “rush job”, and at the same time detract from the other patients also appointed at this time? Or do we just simply apologise profusely, and reappoint the affected patient? What if we did this? What if we were able to have a large bunch of flowers delivered that afternoon to the affected patient’s home? Would that be an olive branch? Or what if we popped a thank you card in the post so the affected patient received it the next day, and included a $10.00 scratch lottery ticket inside the card? “Just a small note to let you know how sorry we are that we let you down with your appointment time today. We are very lucky to have understanding patients like you, when sometimes the simple things can go wrong. I hope that our feeling of luck rubs off onto you. Please accept this lottery ticket as a gesture of our appreciation. Wouldn’t it be better for our patient to be telling their friends how we sent them flowers or a lottery ticket, rather than to be telling them about how we mixed up their appointment? Last night I had dinner out with friends, and I saw some good service recovery but it could have been a lot better. One of my friends had a steak that was presented a little underdone to her liking. And although the manager came over and apologised to my friend for her disappointment, he and his team could have done a lot more for my friend. Firstly, my friend pointed out, that there was nobody checking on the meals and how they were cooked, as soon as the diners began eating them. So my friend battled on with her steak for some time, until finally the rareness got the better of her. What she would have liked would have been someone checking our table as we began our dishes. Had that happened, then her meal could have been returned to the kitchen and been re-cooked quickly. Instead, by the time her meal was re-attended to, everyone else on the table had indeed finished eating, so my friend’s dining “pleasure” was indeed impacted upon by this service defect, and disappointing recovery. Secondly, once the manager became aware of my friend’s disappointment, he personally came to our table and announced that he was “buying her steak”. Now I just thought this was local-speak, but my friend said indeed it was not. What my friend would have preferred him to have said was that there would be “No charge” for her steak. This would have been far more polite, and sincere. It’s important to make sure that all of our communications do indeed hit the mark, and are not ineffective, as this manager’s words were. My friend said that she felt so disappointed that she would probably not be returning to this restaurant. And although there was service recovery at this time, it missed its mark. How are your service recovery systems working for you and your patients? Why Are You Limiting Your Own Successes? I’m often amazed that people don’t always see the solution to their problem. Yet to others the solution is sometimes so obvious. Every day he would say the same thing. “I make my own sandwiches”. It’s the same in dentistry. I hear Dentists say, I want to provide better customer service, but I only have one chair. They say, I want more patients, but they only have one phone line and they only have one person answering the phones. And the same person is checking patients in, and checking patients out, amongst a whole pile of other duties as well. They say, when we get busier, I’ll put on more staff. They say, when I get busier, I’ll add another chair, someday. But the someday never comes. In 1994, when I went from two treatment rooms to three, I plumbed and built for four. A great quotation from the movie Field of Dreams. To be successful in business we need a vision, we need a plan, we need ambition, we need goals, we need faith. We need faith in ourselves and faith in our convictions. Dentistry is a great profession. It allows us the opportunity to heal and to treat. It also allows us the opportunity to impact positively on people, changing their health, changing their appearance, improving their confidence, changing their lives. But some of the most gifted and skilled Dentists I knew at Dental School never went the distance. They never built it so he would come. We all attended the same University. We all received the same education. It’s a lot of years. A lot of dollars and a lot of commitment. And with that sort of investment, we need the business of Dentistry to provide us with a suitable return on those levels of investment. What’s the point of seeing the problems but not taking action to gain improvement? And with improvement comes reward. We owe this to ourselves, for all the time and the money and the commitment we have put into our careers. We owe it to ourselves and our families to be the best we can be. That’s not what we’re here for. We’re not here to keep getting in our own way. What’s the point of that? Is Your Reception Desk Killing Your Customer Service? Say there were a large number of people who need transporting across a river. And all you have is a rowboat. How long do you think you’ll stay in business for? Before someone comes along with a more efficient means of transport. Or someone comes along with a more comfortable form of transport. Or someone builds a jetty on both sides of the river to allow easier more comfortable egress of travellers onto and off of the river transportation. Based upon this you certainly would not stay in the river transportation business for very long with just a piddly old rowboat. And it’s the same in dentistry. When I consult and lecture, I’m constantly telling my clients and attendees that for the most efficient and most comfortable check in and check out of customers and clients and patients, the Dental Office needs to excise itself from the age old paradigm of an upstand reception area surrounded by seated, waiting patients. The way I see it, most Dental Offices have the Dental equivalent of the Barbershop scene from the Movie “Coming To America”. Patients are checking in, and announcing who they are and what they are there for in front of an open audience of nobody knows whos. And the same goes for the checkout process. Are your team members trying to have delicate conversations with your valued clients while they *STAND* at an upstand with a bevy of future clients sitting only centimetres away behind them? Who wants to do business in that sort of environment? The dental upstand was invented back in the olden days to stop extraction patients from dribbling blood across the paperwork. And in those days they also left with an account for treatment being posted at a later date! To be settled at their leisure! Why are we still installing those sorts of “Reception” areas? There is nothing receptive about them! They should be called “Non-Receptions”! The Upstand creates a physical barrier of Us and Them between the Receptionist and the waiting clients! Who wants to start a conversation with the top two centimetres of a receptionist’s head? And what on earth happens in this sort of layout when an appointment is rescheduled or cancelled over the phone? Who wants to be watched by an audience while receiving a cancellation call? I sure as heck know that I don’t! Then, the receptionist needs to miraculously conjure up a patient out of thin air to fill this now vacant time. The receptionist now has to start calling people from a list to see whether they can come in sooner…. in front of the barbershop audience! And of course, what happens when the receptionist starts making calls where people cannot come forward? How do you think she’s going to start feeling, with her audience waiting on her every baited breath? It’s not a very pleasant environment. What’s to stop the practice from creating a separate room where these sorts of calls can be taken in private? A room where treated patients leaving the practice can be processed individually, in private, in a seated environment? And with no unasked for audience! At my practice, when we started processing treated patients across a level table, with both people seated, in private with no audience, our collections, our treatment acceptance and our appointment rates went through the roof! We also decided that arriving clients at the practice could easily manage in a private lounge away from the phone, on their own! Without requiring the presence of a magazine centurion to stand guard! And because of the privacy created in the check out rooms, there was also a creation of understanding in those patients’ minds of what the Clear Next Step needed to be with regards to their oral health and future appointments. And so the result was an immediate reduction in cancellation and reschedule numbers. Because patients had time, and privacy, to go over and gather the information required to ensure they understood the importance of their next Dental Visit. So if you keep on wondering why you’re numbers are diminishing, then take a chainsaw to your upstand, and dismember the barrier. Stop living in the past, and embrace the future of reception. Take a chainsaw to your upstand. After all, we’ve come a long way from the sliding little window of the past….